SHARMINI PERIES: It’s The Real News Network. 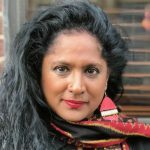 I’m Sharmini Peries, coming to you from Burlington, Vermont, where we are gathered at the Sanders Institute. It’s a gathering of academics, activists, policymakers and people working and had formerly worked on Bernie Sanders’ presidential campaign. We are here to think about the critical times we are living in and the solutions to the problems we are facing. And we are today joined by Carmen Yulin Cruz. She’s the mayor of San Juan. And we’re going to talk about what’s happening in Puerto Rico. Thank you for joining us. CARMEN YULIN CRUZ: Thank you very much for having me. SHARMINI PERIES: All right. Now, long before Hurricane Irma and Hurricane Maria hit Puerto Rico, Puerto Rico was already facing economic crises, but of course, the hurricanes made things much worse. So give us a sense of what ordinary Puerto Ricans are facing in terms of the challenges of the economic crisis and the hurricane crisis. CARMEN YULIN CRUZ: Well first of all, thank you for the opportunity. If I had to describe it using one phrase, I would say it’s the perfect storm. It started many years ago when a very important tax incentive was taken away from Puerto Rico because of political reasons. Companies that would make their profits in the U.S., in Puerto Rico, could repatriate those profits to the U.S., paying very little or no income tax at all. And that made Puerto Rico a haven, especially for pharmaceutical companies. At one point in time, 13 out of the 21 most sold medications in the world were made in Puerto Rico. But that was taken away because people thought that Puerto Rico was being treated differently than other states and that that would just put us in direct conflict in the competition for jobs. So as that started dwindling and patents started just wearing themselves out, the manufacturing jobs started leaving Puerto Rico, very skilled manufacturers. And many people don’t know that most of the electronic circuit boards of Apollo 14 were soldered in Puerto Rico – 13 or 14, I don’t quite remember – but they were soldered in Puerto Rico because of the ability of Puerto Rican hands to do the work that needed to be done. Now we have a 72 billion dollar debt, or so they say, and I say that because that debt has not been audited. And the average Puerto Rican is calling for the debt to be audited, so that we know if we really and truly owe that much money. Similar to when you and I go to the restaurant, we look at the bill. If there is something there that’s not supposed to be there, we say look, you need to take this off and change it, and on the same part, if something was not included, we say look, we’re honest people, we say look, you need to include this. So that was really bringing some very bad austerity measures. Why? Because Congress, under the Obama administration, passed this law called PROMESA, which means promise. Well, it was a promise not to the Puerto Rican people, but it was a promise to the bondholders of repaying the debt that had not been audited. Debts have to be repaid, but if you buy something for cents, you shouldn’t be repaid in dollars. It’s not fair to the people of Puerto Rico. And austerity measures started really taking a toll. And here comes Irma on September 6, and 14 days later Maria on September 20th, two of the most ten devastating storms of the decade. We were left with no electricity. The majority of Puerto Rico took about six months. About half of Puerto Rico took about one year to get their electricity city back. Now, we don’t want electricity to be able to take hot showers or air conditioners. We wanted to be able not to have to operate with the lights on our cell phones, so that children can have a nebulizer and take care of their asthma, so that people that depend on oxygen can live. And it didn’t happen. Those that were supposed to come to our aid did not come to our aid. And by that, I mean the federal government. So people don’t have to deal with the long lines that we dealt with in the aftermath of Irma and Maria, but our electrical issues are not done. We lose our electricity a couple of times a week anywhere in Puerto Rico. There are still what they call pockets, bolsillos, places where the electricity will never be taken back. And there is some sort of a hope that solar lights, solar panels and solar energy overtake this, but on top of all of that, the Puerto Rican government right now has decided to privatize essential services. They are selling the Puerto Rican Electrical Power Authority, which after all is unfair for Puerto Rico, but it is unfair for the American taxpayer because most of that transmission system of the electrical system was put back as if it was new. It didn’t make any sense. We didn’t fix any long term issues. SHARMINI PERIES: What’s estimated at 70 percent? CARMEN YULIN CRUZ: The increase in suicide attempts. Isn’t that bad? SHARMINI PERIES: That says it all. 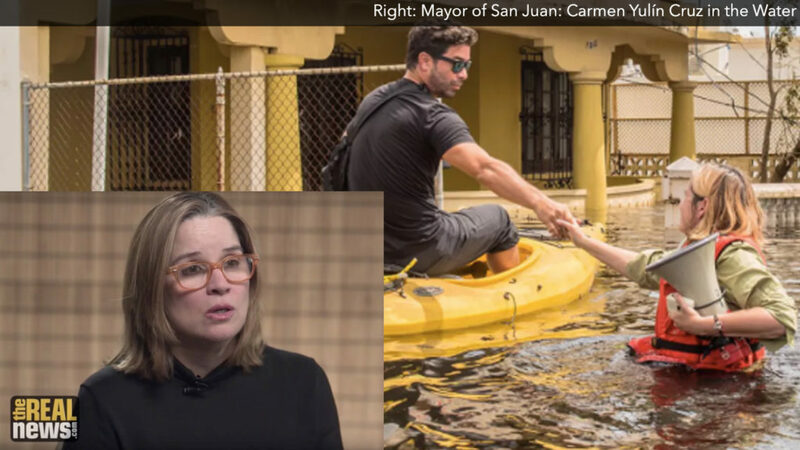 CARMEN YULIN CRUZ: That says a lot about how people are feeling. Between 30 and 40 percent is the estimated increase on suicides. Slowly but surely, our economy is coming back. We’re getting tourism back, which is an important part of our economic development. But the actual, long term or short term structure of what Puerto Rico will look like, of a transformation not only of reconstruction, we’re not there yet. There doesn’t seem to be anybody at the helm. And like I said, the Puerto Rican government is also privatizing education. They actually hired the same people that did Katrina and the privatization with the charter schools. If it didn’t work in Katrina, why did we think it’s going to work in Puerto Rico? So it’s a crisis after a crisis, it’s a storm after a storm. A lot of it, it’s people made, a lot of it is Trump administration made, and some of it it’s our own responsibility. SHARMINI PERIES: All right. Let’s take up schools here. You said you had a lesson in New Orleans with Katrina, where the school system wasn’t good to start with and their literacy rates weren’t great to start with. And they took advantage of the crisis of Katrina and went in and established all kinds of charter schools. Now, the way in which charter schools are presented to us, as the solution to the problem, and that parents will have a greater control, the standards will be better and so on and so on and so on, isn’t the reality or the outcomes, as far as New Orleans is concerned. So why did it get introduced when we knew better? CARMEN YULIN CRUZ: Well first of all, if they were so good, there would be more than 10,000 of these during the in or around the United States. There is a thing called disaster capitalism, but this didn’t start with Irma and Maria, so don’t let anybody fool you. They’re going to tell you thousands of Puerto Rican have fled, the amount of students have gone down, so thus we have to close schools. No. Wouldn’t it be better, rather than having 35 children in just one classroom to have 15 to 20 students in one classroom? See, when you close the school, you disrupt the community and you disrupt an area which is usually the area where the community goes, not only during the day but at night. But the current governor of Puerto Rico favors privatization. I don’t favor privatization of essential services. And it started with the last administration two years ago and it then happened with this administration. It’s interesting, politicians, bad politicians, are like that. They criticize something when they’re not in power, and then they do the same thing when they’re in power. It’s a whole bunch of nonsensical things. It’s as if common sense would be the least common of the senses in public policy. So now we’re not only selling our schools, we are also, because of the fiscal control board and the plan that was required of the University of Puerto Rico system, which has 11 campuses all over Puerto Rico, the credit for an undergrad has increased threefold. It went from 54 dollars or 57 dollars to 157 seven dollars in one year. Ergo, we have 15,000 students that are on defer payment, they cannot pay their tuition. So if you have a less educated group of people, you will have people that are more given to be fed whatever kind of nonsensical, not real news or public policies that are not people-centered. They will be private enterprise-centered, they will be big interest-centered, but they will not be people-centered, and they will not give people what they want. So they’re saying let’s close 4 of those 11 campuses. We’re in Vermont, in the gathering of the Sanders Institute. Just think for a moment that the University of Vermont that’s in Burlington, Vermont would be closed. A good chunk of the economy of Burlington would go away with it. Well, that is exactly what will happen if in places like Utuado and Arecibo, which are smaller towns outside of the town of San Juan which is the capital of Puerto Rico, that’s exactly what will happen. People will leave the towns, will become towns where people will leave war and then it’s a self-perpetuating prophecy. So it almost seems like essential services are being displaced, are being made bad, and that schools cannot open for about six months. In San Juan, our three municipal schools opened October 23, so that was one month and three days after the hurricanes hit they opened on their full scale. We didn’t have any air conditioning, but no kid is ever going to die because they go to school without air conditioning. But we provided the essential services pretty quickly. So it’s disaster economics, what Naomi Klein calls disaster capitalism at its best, and we can see it surfacing its ugly head all over the Puerto Rican landscape. SHARMINI PERIES: And what is happening to the electrical grid that we heard about so much early on after the storms? CARMEN YULIN CRUZ: Well, the grid has been, for the most part, changed. It hasn’t been transformed. There’s this little thing called the Stafford Act which gives life to FEMA, that in a very non-productive way says you have to use the dollar that I give you to reconstruct. So if you had a cable system that goes through large mountains and you can lose them in the next hurricane, or if you have a cable system in the city of San Juan which you cannot put underground to make sure that people don’t suffer the way they suffered before, you can’t do it. You have to do the exact same system. So again, public policy that makes no sense. Because that’s not geared to solving people’s problems. It’s still very unstable, it makes life very difficult for people, especially for those that live in a disenfranchised community or a disadvantaged community or poor communities. For some problem in Puerto Rico, we have an issue about saying that our communities are poor. About 60 percent of the Puerto Rican population live below the poverty line. 70 percent of the Puerto Rican population needs food stamps in order to put food on the table, so that has been sold. Our Puerto Rico Electric Power Authority is being sold. So the American taxpayer paid for the majority of this transmission system to be done as it was before, not the best but just completely new, and now it’s going to be handed to somebody that’s going to decide where our economic development basically goes to. When you control the energy, when you control the sources of energy, when you control water, which in Puerto Rico most of the time gets to you because it’s pumped by electricity, then you control the landscape and the blueprint of years to come. That’s why I’m totally against selling or privatizing our essential services. SHARMINI PERIES: And what’s the fight back looking like? CARMEN YULIN CRUZ: It’s looking good. A lot of what happened during Irma and Maria is that community grassroots organization couldn’t and didn’t wait for government. In San Juan we have a philosophy that the government is a platform upon which communities set their agenda, and we are there to make sure that their agenda gets realized. So it isn’t the mayor’s agenda, because the mayor will stop being mayor at some point. It is truly the people’s agenda. That does not mean that we don’t have our challenges, that does not mean that I don’t try to convince communities that perhaps their agenda is not the right agenda, but ultimately, the community wins. It’s not because we let them win, it’s because the way we see power, the way I see power is the power is in the streets. And it is the people’s responsibility to make sure that the money that they put into the governmental accounts, via their taxes or sale tax and so forth, is used in a way, in a manner that they want. So people are taking activism into their own hands. They’re being able to forge alliances. Of course, like in many parts of the world, they look at any governmental entity or any politician with a certain amount of distrust, which politicians have earned, with a certain amount of “what the heck do you know about my plight.” Well, that is the truth, but it is starting to be galvanized. It is starting to become a fight for a better life, not for survival, because we don’t want to survive, we want to thrive. And also, we find, as I found in the Sanders Institute and this gathering, people of shared values. You’re from Sri Lanka, you want the same thing that I want in Puerto Rico. We’re both from islands, but we want the same thing. We want access to healthcare and we don’t want our health to depend on how much money we have in our pocket. We want access to education because that is the great equalizer and it provides upward mobility. And by upward, I don’t mean more money, more money doesn’t necessarily mean, if we do things right, happiness. We want unions’ rights to be upheld. San Juan is the only municipality in all of Puerto Rico that recognizes the rights of its workers to organize. Isn’t that crazy? SHARMINI PERIES: That is crazy. CARMEN YULIN CRUZ: I mean, that’s crazy. Everyone should have the right to organize. We want to have a society that’s egalitarian, where people from the transgender community or the LGBTQ community or immigrants that don’t have the necessary papers to go into Puerto Rico, are treated with dignity. And look, this little string here was given to me by a DACA student in San Antonio, Texas. I promised I was going to wear it ever since. But we have about 350 DACA students, most of them in San Juan. We have 11 detention centers for immigrants. We want to be able to share in a new society of quality and people are starting to see that if they join together, if they are putting effort in it, if they organize, if they – Nina Turner was saying today – they protest, they plan and if they persevere, that a different day is possible. We can’t wait until tomorrow, there’s too much sense of urgency for us. 3000 Puerto Ricans died. 3000 people, because those that were supposed to come to our aid didn’t, because they turned their backs on us, because the political class in Puerto Rico decided to shut up. And when there’s a humanitarian crisis and when human dignity is being trampled on and when human rights are being taken away from people, you have two choices. You speak up and you tell the truth no matter what the consequences, or you stand down and you become an accomplice to a narrative of a precedent that frankly, most of the time and certainly in terms of Puerto Rico, wanted to look good and feel good rather than doing good. And because of that, 3000 people will not see that day of light. Now, Maria did not ask us, “Who did you vote for” or “who do you love, what is your educational level?” She just destroyed everything in her path. And 3000 people did not have to die. They died because one man that had the power to do more did not do more, and the world needs to continue to know that. And we need to continue to fight that. Because that’s the same fight that’s happening at the border, that’s the same fight that’s happening when young men and women are calling for sensible gun control laws. That’s the same fight that is happening when people of all colors are saying, “I’m human, treat me like a human being, don’t try to make me be invisible,” like what is happening with the transgender population. But where there was so much despair and darkness, the American people, they opened their hearts and they took care of us, they gave us food and water and beds, and they let us know that we weren’t alone and that our lives mattered. And our lives matter, just like everybody’s life matters. So we have to make sure we put people in positions of power that allow for that common bond of humanity to just soar high and mighty and not let us be consumed by hatred and division. And wherever I go, I say the American government failed the people of Puerto Rico. Maybe it was easy to dismiss us because we’re a colony of the United States. We don’t want to be a colony; the American people don’t want us to be one. But nobody has a right to let people die when they have in their hands the power to make it not happen. But the American people showed the world that it wasn’t paper towels that needed to be thrown at us, it was good, old-fashioned people helping people and lending a hand to those in need. And for that, people were saved because of that, because the world took notice. I will forever be grateful to people that I will probably never meet, but that had an opportunity to either shut up or shout, and they shouted and they magnified our voices, and nurses that not only went to tend care of our wounds, but they went to Congress and knocked on doors and continued to be advocates, the union workers from the AFLCIO that went and helped us and left their homes and paid their own way. That is what America is all about, and that is what I will forever be grateful for. SHARMINI PERIES: That was Carmen Yulin Cruz, mayor of San Juan. I thank you so much for us. CARMEN YULIN CRUZ: Thank you.